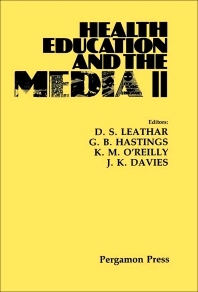 Health Education and the Media II is a collection of papers that covers the various issues in utilizing media for promoting health education. The materials in the book are organized according to their respective theme. The first part of the selection presents papers about the theorecal issues of use of the media for health education, such as the application of market segmentation in alcohol and drug education, as well as social context of alcohol consumption and sources of information among high school alcohol abusers. Next, the title covers articles that deal with the practical issues, such as an analysis of media coverage and effective communication strategies with older people. The remaining papers discuss the areas for future developments, including more constructive use of existing resources and the potential for tabloid newspapers as vehicles for promulgating health promotion messages at district level. The book will be of great interest to health professionals, public health government officials, and individuals in the mass media industry. Help or Hype: An Analysis of Media Coverage of the 1983 "Pill Scare"